Objeq Delay is the most creative and fun delay we have ever used. You can get results that are astonishing with a guitar or any other source. On Sale at 50% off right now! Applied Acoustics Systems have made a real ‘winner with their Objeq Delay. 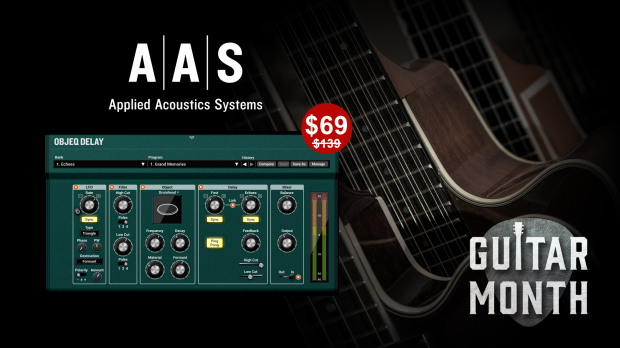 It is a supremely creative effect plug-in combining acoustic filtering with a very clever delay unit. The magic starts with the plate, beam, drumhead, and string “objects” that impart evocative acoustic resonances to the input signal. Further shaping is also available via low- and high-cut filters. The in-series delay acts as a classic unit or can split the first and subsequent repeats to either remodel the attack or create complex rhythmic patterns. A LFO module completes the package with comprehensive modulation destinations to the filter, resonator, and delay parameters. This entry was posted in DontCrack, Plug-ins, Promotions and tagged AAS, acoustic resonator, AMBIENT DELAYS, Applied Acoustics Systems, Chorus, Delay, delay with filter, Flanger, Objeq Delay, resonant delay. Bookmark the permalink.